So you love golf so much, that you do not want to find a way to “escape” from the spectre of golf even when you have donned the chef’s hat and apron for a BBQ session in your backyard? I would suppose then that this is where the $39.95 Golfer’s Grill Clubs play a role. 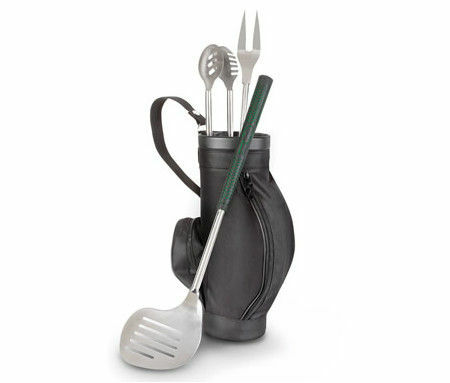 The Golfer’s Grill Clubs happen to be grilling utensils that sport authentic golf club grips, delivering a confident hold as you flip lamb chops and burgers, or turn a swordfish steak. The rubber handles will feature subtle ridges and a soft, tacky feel, preventing perilous hand slippage when reaching over the coals to flip a foursome of burgers. The stainless-steel tongs and fork sport 18″-long shafts, while the sand wedge-shaped slotted spatula lets marinades to drain away before placing food on the grill. All of these tools are lovingly stored in a woven nylon 14″-high golf bag.